The What: NEC Display Solutions of America has launched the V554Q, a large-format 4K UHD display packed with commercial-grade features and a slim design. The What Else: Like other new models in the C and V Series, the V554Q features an anti-reflective high haze coating, full external control, and network capabilities through LAN, and SpectraView Engine Technology, which allows for complete color control. “We’ve listened to our customers in designing the V554Q to be the best 55-inch display tailored for commercial and corporate signage needs,” said Ben Hardy, senior product manager at NEC Display Solutions. 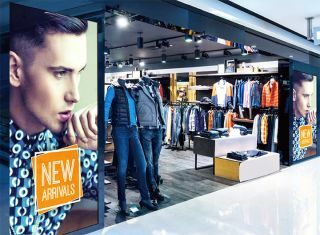 “The V554Q has best-in-class, high-haze anti-glare coating, updated connectivity, and both landscape and portrait orientation support to seamlessly fit any digital signage environment. The V554Q also includes an OPS and SOC Powered by Raspberry Pi option slot for modular expansion capabilities. This allows customers to integrate modular components to create the solution that they need. In addition, the V554Q is compatible with NEC Display’s NaViSet Administrator 2 software, which enables customers to control, monitor, and manage multiple displays and projector settings in an all-in-one support system. NaViSet features unified control, asset management, and reporting in a graphical user interface. The 554Q features IPS panel technology with 3840x2160 native resolution, and is designed for 24/7 operation. Its connectivity options include three HDMI 2.0 and two DisplayPort 1.2 connections, plus one DisplayPort out powers a 60Hz signal for UHD performance via a single cable. It has Wake On Input-Signal with custom input detect functionality; IR and button lock functionality; full scheduler functionality, including holiday mode; and a full metal chassis and carrying handles for easier installation. The Bottom Line: With a 4K UHD display featuring 500cd/m2 of brightness, the V554Q is well suited for corporate signage, transportation, and retail-based applications that have high ambient light and the need for high resolution because of closer average viewing distances. With V554Q’s SpectraView Engine—NEC’s proprietary color management and stabilization system that provides complete color control and uniformity correction—the display is also well suited for color-critical applications such as medical offices and broadcast. The V554Q can be ordered through sellers immediately. For a hands-on demonstration of the V554Q, visit NEC Display at booth 2300 of the Digital Signage Expo, taking place in Las Vegas March 26-29, at the Las Vegas Convention Center.